BRAIDS 2016 – Braids, Bands and Beyond. The conference at UPS Tacoma, Washington is over. What a week it was. My soul is happy, my heart is full, my brain is jumping with excitement, and my fingers have been wonderfully well-tangled in strings all week. The Proceedings of BRAIDS 2016 containing articles by all 30 instructors is available through the Braid Society, Braidershand and Giovanna Imperia Designs. If you are not already a member of the Braid Society, there are many reasons to join, one of which is the fabulous conferences. But, even if you can’t attend one of those, the annual Journal which is aptly named Strands, is alone well worth the price of admission. I had missed out on receiving my journals the last two years because I had lost my P.O Box. Debbie brought my copies for me with her from England. They are juicy! 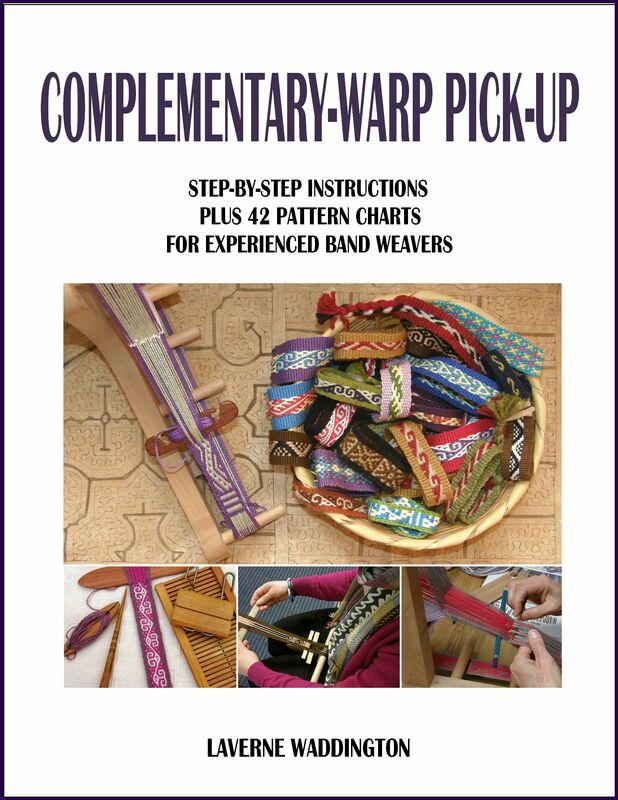 Many of the instructors at Braids 2016 have authored the articles alongside other renowned braiders and band weavers. In the following photo, fans of Susan Foulkes will catch a glimpse of an article on Latvian bands in the 2015 issue with detailed instructions and photos. Strands…after attending an event like this you start to see strands everywhere and in everything. Strands…wavy tentacles of glass at the Chihuly exhibit in Seattle. Strands…branches extending in all directions from the trunk of the massive sequoia on the UPS campus like strands of thread waiting to be worked into a braid. At the conference, strands of yarn, wire, raw hide and even human hair were plied, split, twisted, turned, crossed and looped into beautiful braids and bands as well as exquisite pieces of jewelry like the brooch of braided hair below. Ruth MacGregor and Carol James work on a Peruvian head band braid in Rodrick Owen’s workshop. I was lucky to have the chance not only to instruct but also to take Rodrick Owen’s class on Peruvian head band braids along with Ruth and Carol (above) and several other participants from the 14 countries and 6 continents that were represented at the conference. I was proud to be representing South America. We spent the first morning setting up our looped strands to braid. I was determined not to miss anything and took lots of notes. I find that it is best to get things written down in my own hand and in my own way as a supplement to the instructions we received in our color handouts. That is what works best for me. I really want to continue working on these kinds of braids and I have plans to try and make some wrist cuffs with them. I wanted to make sure that I was absolutely clear on the process. For that reason, I stayed with working on just the one braid for the two days rather than learn the second one that Rodrick presented on Day Two. I know that I will take the opportunity to learn that second braid in a class with Rodrick some other time in the future. Sprang expert and instructor, Carol James, also took the class. I am sure that she felt, like me, that being a student now and then is a priceless and necessary experience for teachers. Rodrick demonstrates the second braid on Day Two. My braid in progress…with some mistakes and lumps and bumps while I get the hang of managing the tension…but I am very pleased with it! I bought some Valdani cotton at the conference in the Braiders’ Bazaar so that I can work on this braid while I am on the road. I am wondering how manageable it will be in cotton which doesn’t have the stretch and ”give” of wool. I had met Rodrick Owen by chance at the Maryland Sheep and Wool festival back in 2010. It has taken me this long to take a class with him even though our paths have crossed many times since. All the wonderful things I had heard about him as an instructor were true. I love workshop tables with their chaos of yarn and sticks and tape and tools and this one which I shared with Jeanne, who kindly shared her photos with me, was no exception. Outside of class time, Washington gave us some glorious weather and the campus gave us lots of opportunities to enjoy it with outdoor eating areas to hang with friends and maybe do some braiding for those who practice the more portable techniques. John Whitley is always able to whip out one of his current projects and keep his skilled hands occupied. Here he is working on a ply-split piece of his own. I met him at Braids 2012 in Manchester and he and his wife Stacy have done some backstrap weaving with me on a couple of occasions since then. Meeting new people and hanging out with old friends…6 of my backstrap weaving students from various parts of the USA are present in this picture. The conference was a great opportunity to meet up with my weaving buddies from all over the USA as well as folks from Europe that I had met in Manchester in 2012. Even a blog follower from Capetown South Africa, Joel, was there. With Annie! You will know her as Aspinnerweaver, the weaver of unique colorful work-of-art guitar straps. We haven’t had much chance to hang out since she moved to New Mexico. Tablet weaver John Mullarkey was at the table too (see below). He likes to tease inkle loom weavers about the supposed inferiority of their chosen equipment and technique to the tablets that he prefers. I think he met his match at that table of fierce inkle loom fans. Jennifer accused him of ”inkle envy”. I got to wear my woven accessories…something I dare not do at home in Bolivia where I have had several things pulled off my neck and wrists in the past while walking down the street. I had woven a neck pouch especially for the conference in which I could stash business cards and card keys. My sample for that project became a wrist cuff and I only realized later that my necklace and camera strap were also good matches. You may remember that I was just one of many many people who had volunteered to weave lanyards for the conference. I contributed a mere 6 of them. There were 175 of them to be made! Having arrived early at the conference with my friend Marilyn Romatka, I was able to enjoy scanning the lanyard table before the name tags were distributed, ooh-ing and ah-ing over the variety of techniques and patterns and colors represented there. It was fun playing ”spot the lanyard” trying to see which of the 175 participants got mine. It wasn’t until Day 3 that I found the last of the 6 I had made around the neck of Braid Society Chairperson Shirley Berlin. Unfortunately, I never found out who made the pretty purple lucet-worked lanyard that I was given. The weather was perfect for outdoor weaving and I wish I had thought of suggesting doing just that to my group of backstrap weavers above. There were certainly plenty of trees to tie to and lovely lawn in which to sit. 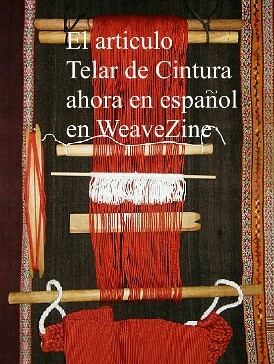 We studied supplementary-weft patterning and double weave over two days. Brian and Karen are working on their double weave here. It was lovely to meet up again with Brian who had woven with me at Vavstuga last fall, as well as Eileen, my host on several visits to Austin, Texas and Tracy with whom I have woven quite a few times in California. Karen is the first Alaskan weaver I have ever had in a class. She really took to backstrap weaving. It was nice to have two UK participants…Kay and ply-split expert and instructor Julie Hedges. Barbara had interesting stories of her travels in Peru with Martha Stanley. Susan was there. I had worked on the Weavolution booth with her at Convergence in Albuquerque 6 years ago. Beverly and Heidi were new backstrap weavers and I hope they enjoyed the class enough to continue their new skills at home. When these weavers were happily settled into their double weave adventure, I took the opportunity to go out and briefly visit a few other classes that were in neighboring rooms. Here are two of my dear backstrap weaving buddies. Braiding expert, Ingrid Crickmore, is instructing pick-up patterns on finger looped braids while inkle- weaving artist, Annie MacHale, watches. Dominic Taylor braids away in the background. I met Dom at Braids 2012 in Manchester and he was here in Tacoma to teach cylindrical braids in raw hide. 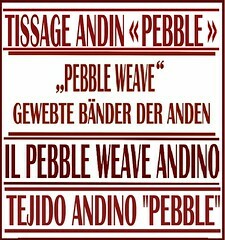 I am grateful that he made me aware of some of the beautiful work in braided raw hide that is being done by the gauchos in Argentina. Here are just a few of the pick-up patterned loop braid samples that Ingrid brought for her workshop. Annie showed Marilyn and me something of what she had learned with Ingrid in the finger-loop braiding class. 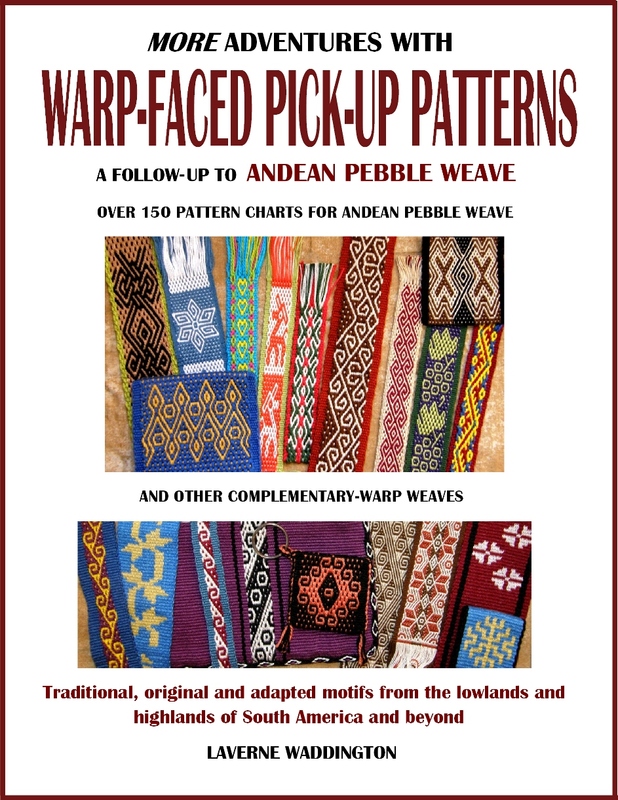 It was interesting after having just taught double weave on the backstrap loom to learn about these double layer braids that connect when colors are exchanged between layers and which allow motifs to be created through ”pick-up”. The braider can decide which way she wants to handle a dual-colored loop to bring one of the two colors to the upper face of the braid to form a pattern. Ingrid’s article in the conference proceedings goes on to explain more. Carol James was just down the hall wearing one of her amazing sprang creations and watching over her group of happy sprang braiders. I saw some really sweet pouches come out of that class. Here I can treat you to a closer look at Carol’s sprang garment while she advises one of her students. Marilyn took this class and gave Annie and me a demonstration when we got back to her place after the conference. It was nice to see it in action on the frame. I had been at one of the fun kitchen parties at Braids 2012 where Carol had placed yarn in my hands and given me an impromptu class in the ”scissors and pinch” technique….so beautifully explained and something which I have never forgotten. Marilyn set up a piece with space-dyed yarn that looked amazing. While I didn’t get to visit Anna Sparr’s class on braids made with human hair, or ”hair work”, I got to attend her evening lecture and see some of her jewelry pieces. It is a technique that dates back to at least the 17th Century. Anna’s family originates from Våmhus in Sweden, home of the traveling hair workers who would move from city to city all over northern Europe offering their work and providing a significant source of income for the village. I dropped in quickly to another room where Ria from The Netherlands was busy braiding in Leigh Morris’ class on variations of zig zag braids for jewelry. Ria and I had met in Manchester and it was lovely to see her again. She even remembered the liking I had developed for Dutch stroopwafels when I had visited with Marijke van Epen and brought me a bag of them all the way from Holland. There was a break from the talks and workshops mid week for an outing. I joined the group that visited the Burke Museum and the Mood Indigo exhibit at the Seattle Asian Museum. I had already seen Mood Indigo in the spring but these things are always worth a second look. This was the first time I was able to see real Maori pieces. Of course, I very much wanted to get my hands on this skirt and look at the other face of the taniko wasitband. I have used weft twining here and there in my work and now I am inspired to do some more. It was a lovely day out and about. We had lunch by the water and there were masses of blackberries nearby just asking to be picked. I couldn’t understand how they could just be left there for the taking until someone told me later that I had been stomping about in poison oak while I was happily picking. Fortunately, I did not suffer any effects….and the blackberries were delicious! My eye was caught by Judy walking about with an interesting bag. She had taken a trip on the Silk Road and picked up this bag in Kyrgyzstan. 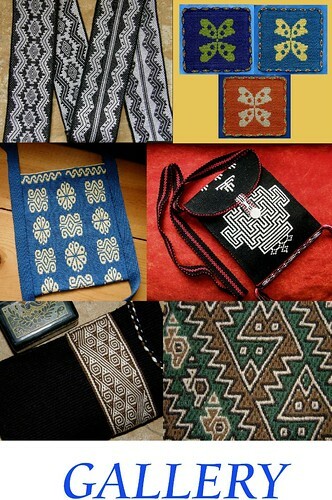 I was struck by the fact that I had just posted about Kyrgyzstan textiles and looms in a blog post and welcomed the chance to be able to examine the textile. The conference ended with a banquet which I chose to miss. It had been a busy and exciting week and I felt that I needed a little down time. I walked out on a quest to find a good viewing spot to peacefully watch the sunset over Mt Rainier, or Tahoma. I found one perched on top of a wall and enjoyed the colors of the sunset from orange to pink to blue as the sun slipped from the sky. For me, it was a perfect ending to the week. I then met up with friends when all the banquet excitement had subsided who told me that the venue for the next Braids conference had been announced…Kyoto, Japan in 2019. The departure day at conferences is always bewildering. How did 5 days just slip by so quickly? You regret the pictures you didn’t manage to take and lament the fact that you didn’t get to hug certain people goodbye. This departure was softened for me as, rather than heading off alone, I was leaving with Annie to spend a few days at Marilyn’s place in Seattle. On the way home we had a frantic and fun time at Shipwreck Beads buying findings for jewelry making, I have lots of ideas for making more necklaces and bracelets from my woven bands. We bumped into other conference folk there which made it feel like the conference hadn’t really ended at all. At Marilyn’s, between harvesting her figs, apples and Japanese plums, we spent time on the floor sharing the techniques we had learned in our conference workshops. That was an excellent way to reinforce what we had learned and for me to update and extend my notes. We visited the Chihuly Glass Museum which was breathtaking both inside and out. We strolled about the gardens soaking up the colors and shapes. And then, from that strange world of glass, it was back to nature, strolling the wooded trails near Marilyn’s home to a special place that she calls ”Middle Earth”…more strands! Annie then headed back to New Mexico and I went south to my friend Betty’s place where there were blueberries to be picked. Have I mentioned that I love to pick and eat fruit straight from the trees? Betty and Ladella took me out to meet with a group of Karen community backstrap weavers who get together every Thursday in a nearby community center. The ladies were not weaving and had not brought their looms but I got see some of their textiles and I was able to demonstrate some backstrap weaving of my own for them on a tiny narrow warp. I showed them how my loom is set up and operated to weave the Andean Pebble Weave structure. They were fascinated. One lady, Ra-day, who I was told is the best weaver of the group, was so intrigued that I gave her my warp to take home to study. I am sure that she will quickly see how it all works and I would be thrilled if she started playing with the technique herself. Isn’t it amazing how strands of yarn can connect people creating common ground and understanding and overcoming language barriers? Ra-day, on the left, and one of the other Karen community weavers examine the picking cross in my warp. All the information needed for experienced backstrap weavers such as these to set up a warp like this is there. They examined the threads that were enclosed in the two sets of heddles. I admired one of their woven pieces for its colors and lovely warp-float pattern and, before I knew it, Betty had bought it for me as a rather early birthday gift :-). It was one of Ra-day’s pieces and I asked her to pose with it with me. …greet a glorious Sydney morning. Good morning Australia! If you look closely you will see Sydney Harbour Bridge and the Sydney Opera House beyond it. Braids 2016 already feels like it was a long, long time ago…. Let the magic live on….you can buy the book of the conference proceedings from the Braid Society website or from Braidershand (where you can also buy Rodrick Owen and Terry Newhouse Flynn’s new book Andean Sling Braids: New Designs for Textile Artists), or from Giovanna Imperia Designs. Thank you for the vicarious Braids conference experience! Love the photos and stories. Hi Laverne! Sounds like an amazing gathering. 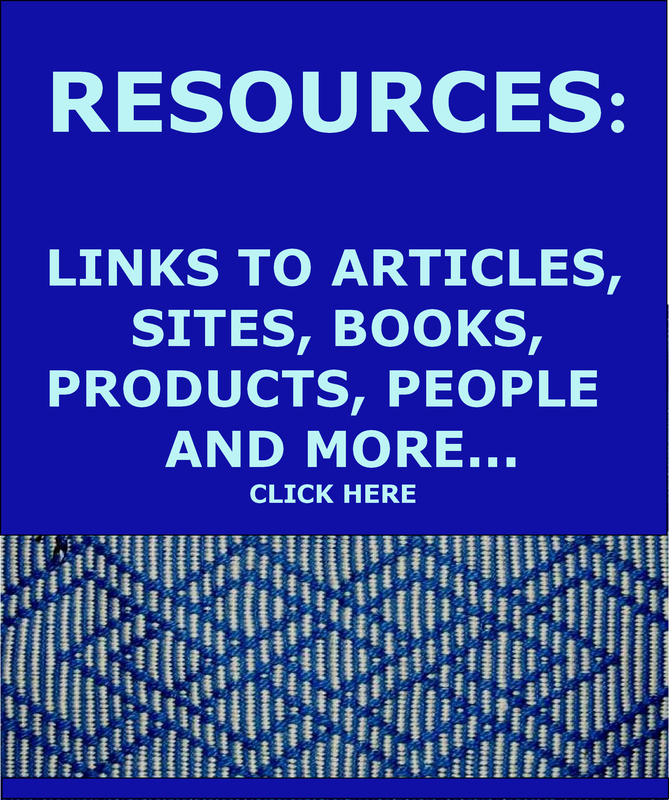 So great to read your blog as you share your fiber arts adventures! Please stay in touch and safe travels! Thank you for such a great post and looks like an absolutely amazing conference. Too many things to add to the list! Lovely report on the conference Laverne. I enjoyed being there very much too. Oh, dear, I don’t have enough time to weave as it is – but braids!!!! What an amazing blog post! Looks like you had s fabulous time. My head would be spinning! It was great seeing and studying with you again. The conference was the best I’ve ever attended and I’m already saving up for Japan in 2019—see you there! It was good to meet you there Laverne, thanks for the great blog! What an amazing conference. In hindsight, I wish I’d gone. It looks amazing. Thank you for sharing, always love looking at your stuff. Was great to see you again. Hi Laverne! Thanks for all the great photos and descriptions of the Braids conference and beyond! It’s just great to browse over it all, esp since I had to miss so much of the conference. And I love your leaving Seattle and arriving in Sydney photos, what a contrast of two beautiful places! What a great time I had at Braids and afterwards. I’m happy to have your great photos to look back on. You might find me a frequent visitor to this post! Hi Annie. Yes, it’s lovely to look back on these events when some time has gone by and your memories of it are not quite as sharp. I hope we meet up again soon. great post laverne, and lovely to see such a good overview, at the same time very personal.